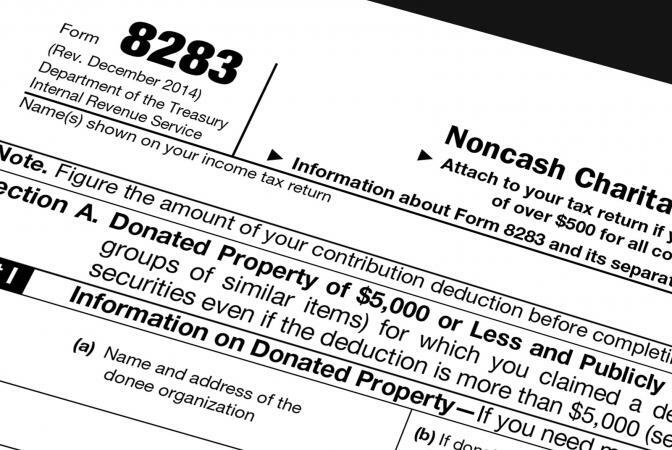 Form 8283 is a federal tax form used to claim certain non-cash charitable contributions. Non-cash contributions include virtually any item you donate that is not money, including clothing, household items, vehicles and collectibles. As an individual taxpayer, you can claim any charitable contributions you make on Schedule A as part of your itemized deductions for the tax year. If your deduction for non-cash charitable contributions is more than $500, you must provide additional information about your donations on Form 8283 and attach this form, as well as Schedule A, to your 1040 tax return. If you've determined the value of your donations requires you to complete Form 8283, you'll need the addresses and names of organizations to which you donated, the dates of your donations, and a list of items you donated. For any non-cash donation worth less than $5,000, complete Section A, Part 1 of Form 8283. Most non-cash charitable contributions fall under this category. Note that the $5,000 limit is applied specifically to an item or group of similar items. For example, if you donated a car and its fair market value at the time you donated it was greater than $5,000, it would not be reported in Part 1. Similarly, if you gave several pieces of furniture as one donation to a particular charity and the total value of the donation was greater than $5,000, it would not go in Part 1. However, if you made many small donations of clothing and household items throughout the year and the total value of all these donations was more than $5,000, but the value of each donation separately was less than $5,000, you would list these donations in Part 1. Write the name and address of the organization you donated to in column (a) for lines A through E. Treat each line as a separate donation, even if you made several donations to the same organization on different dates. If the item you donated is a vehicle, check the top box in column (b) and write the vehicle identification number (VIN) in the second line of boxes in this column. Write a description of the item(s) you donated to the organization in column (c) for lines A through E. For example, you might write 'clothing and household items' to describe a donation you made to a thrift store. Provide the date of your donation in column (d) for lines A through E. This information may be shown on your donation receipt. Fill out columns (e), (f) and (g) for any single donation that is valued at more than $500. If you acquired the items you donated on various dates, write 'various' in column (e). In column (f), state how you acquired the items: for example, by purchase, inheritance, gift or exchange. Report your basis in the items in column (g). Your basis is the price you paid for the item, or the amount the purchaser paid for the item if you received it as a gift or inheritance. Report the fair market value of the items you donated in column (h). The fair market value is the amount an unrelated buyer would be willing to pay for the item. If you aren't sure what the fair market value would be, you can use thrift store value guides provided by organizations such as Goodwill Industries or the Salvation Army to calculate the fair market value of your donations. Section A, Part 2 is required if you donated only a partial interest in an item or if you attached restrictions to your donation (for example, you required the charity to hang the artwork you donated up in their headquarters). Most taxpayers can skip over this part of the form. If you donate an item or group of items that have a fair market value of more than $5,000, you must complete Section B, Part 1 of Form 8283. This section is located on the second page of the form. Items that are valued at more than $5,000 require a qualified appraisal to determine the fair market value of the donation. Many organizations are aware of this rule and offer a certified appraisal when you donate. However, if the organization does not offer an appraisal and you believe the item's value is more than $5,000, you must obtain the appraisal on your own. Check the box on line 4 that describes the type of item(s) you donated. Complete columns (a), (b) and (c) of section 5, lines A through D. Describe the item you donated in column (a), the condition of the item in column (b) and the appraised value of the item in column (c). Complete columns (d), (e) (f) of lines A through D. Column (g) is only used to report bargain sales. Bargain sales occur when there is a transfer of property in connection with a sale or exchange. For most donations, this column does not apply. If you do not use an appraisal to value your donations over $5,000, complete columns (h) and (i). However, since you're required to obtain an appraisal for items over $5,000, these columns can usually be left blank. Have your appraiser complete Section B, Part 3. This is the appraiser's declaration section. Have the organization you donated to complete Section B, Part 4. This is a statement from the organization confirming receipt of the items you donated. Appraisers and organizations may provide separate statements to you containing the information required by the form for Parts 3 and 4. If this is the case, simply attach the statements to Form 8283. After you complete Form 8283, add up the fair market values of the donations from Sections A and B and write the total on line 17 of Schedule A. 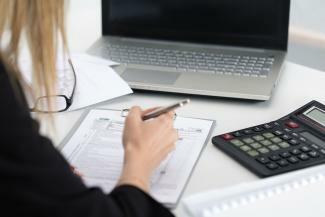 The total amount you can deduct is usually between 20 and 50 percent of your adjusted gross income. The deductible percentage depends on the type of organization you donate to, but most organizations fall under the 50 percent category. For example, if your adjusted gross income is $50,000, you can deduct up to $25,000 in charitable donations. Charitable contributions in excess of your adjusted gross income limitation are carried forward for use in future tax years. IRS Publication 526 provides additional information concerning charitable contributions. You can find information about limitations and special scenarios that apply to Form 8283 in this publication.